Lux Row, the new bourbon distillery in Bardstown, Kentucky, set its first fermenters today. In a few days, that liquid will be distilled, entered into barrels, and placed in the new warehouse to age. Lux Row is the first distillery for Luxco, a long-time non-distiller producer (NDP), and the seller of such bourbon brands as Ezra Brooks, Rebel Yell, Blood Oath, and David Nicholson. Announced in 2016, it is now open for business. Although nothing made at the new distillery will be available for purchase until 2022 or so, now is a good time to pay attention because Lux Row Distiller John Rempe and his team are documenting their progress on Facebook, Instagram, and their own web site. As of today, they are transitioning from construction to production. Luxco, which is based in St. Louis, has been selling bourbon, and a portfolio of other distilled spirits products, since 1958; as the David Sherman Company until 2006. For most of that time they were a regional company. 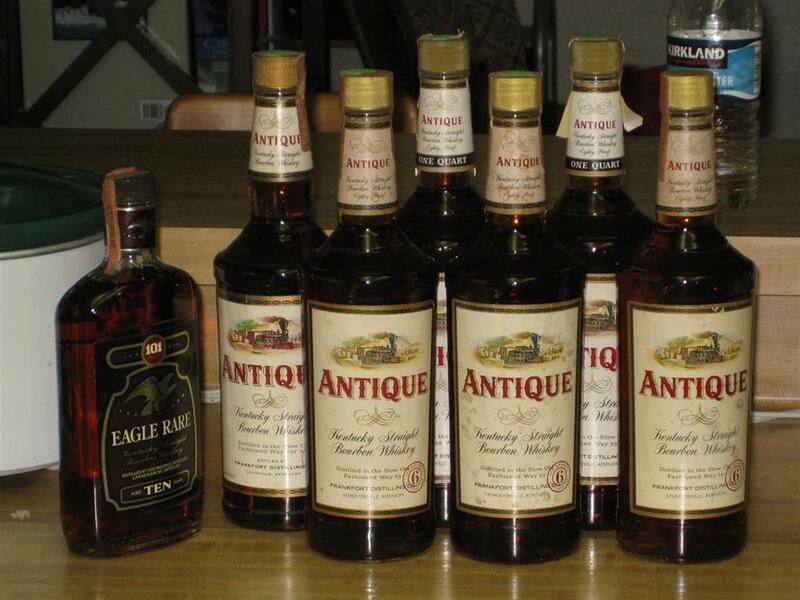 About 20 years ago they acquired several minor but national bourbon brands. They have been building on that to become a significant player, especially in American whiskey. Rempe is their long-time blender, R&D, and quality control guy. He has moved to Bardstown where he retains those roles with the added responsibility of distiller. When Lux Row claims to be 'family-owned,' they are talking about the Lux family, Luxco's owners. As an NDP, Luxco purchases the whiskey it sells in bulk from distillers. They typically buy it long before they intend to sell it. As such, they have an aging inventory of about 50,000 barrels. After 60 years as a successful NDP, Luxco decided to take the plunge and become a distiller because its usual suppliers could no longer provide enough whiskey for Luxco's needs. That is a testament to how robust the American whiskey industry is right now. Their intention is to make all of the whiskey for their four principal brands at Lux Row. Although it is not yet open to the public, Lux Row/Luxco is a member of the Kentucky Distillers' Association and will be a stop on the official Kentucky Bourbon Trail. Doesn't that look nice? Sure, but does decanting do anything for the whiskey? With some wine, decanting prepares the wine for serving. It does this in two ways. First, proper decanting keeps sediment in the bottle. Second, it aerates the wine. Neither is an issue with whiskey. Because we call the second container a decanter, people tend to apply the wine analogy. Whiskey is more robust than wine. There is very little you can do to hurt it or help it. Decanting whiskey has no practical value. So why decant whiskey? The sole reason is so you can serve it from an attractive decanter rather than a tacky bottle. It is more about decorating than drinking, which is not to say decorating is a trivial thing. To personalize this, I have a lot of whiskey around the house. Some of it is in cabinets but some is out in the open, in several different rooms, in bottles. Sometimes I wish I was the guy who keeps a nice decanter of fine bourbon on a silver tray with a few matching glasses, on a spiffy side table in my elegantly furnished sitting room. 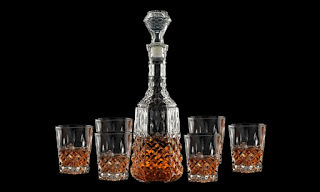 Maybe two decanters, the other one with the house cognac. In my imagination it is a Victorian scene, but there are modern equivalents. For better or worse, I am not that guy. If you are that person, I salute you. I may not practice elegance, but I respect it. 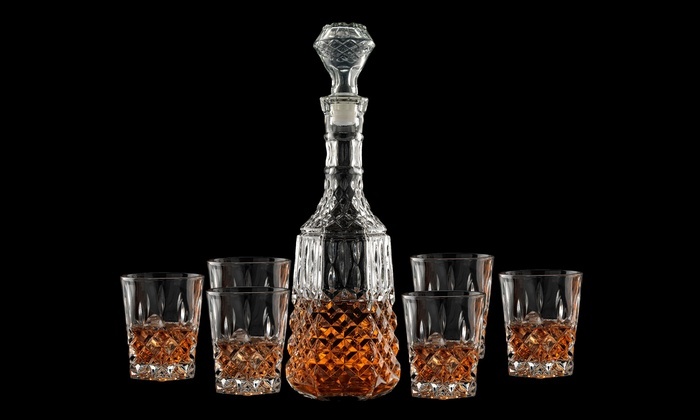 There is nothing wrong with decanting, but don't believe anyone who says it affects the whiskey one way or the other. It doesn't. From a lifestyle perspective, maybe the way you enjoy whiskey (or any fine spirit) is to buy a bottle, drink it until it is gone, then buy another one of the same or different provenance. If you are that person, the decanter model works great for you. Again, there are times when I wish I was that person, but I'm not. If you are, God bless you. That is a perfectly fine way to be too. So, to decant or not? As with most whiskey-related questions, the only right answer is to do what pleases you most. HopScotch is an adults-only evening to benefit the Peoria Playhouse Children's Museum in Peoria, Illinois. They invite a few of their favorite local restaurants and breweries to bring in signature whiskey cocktails and locally-crafted brews. The event also has live music, a silent auction, and hands-on activities. Food too. I don't know how hands-on you'll want to get, but I am one of the activities. Holders of a VIP ticket can hang out with me in the VIP Whiskey Lounge and sample a selection of fine bourbons. My books will be available for sale and signing. I'll be there to pour the drinks and talk about all things American whiskey. The whole event sounds like fun. "HopScotch is our annual adults-only event that helps us kick off the new year. The Cookery returns providing guests with savory and tasty selections while you explore the museum, participate in the activities, and make new friends. You will see Noir and Hearth again this year providing their delicious whiskey cocktails. We welcome Edge, Tannins and Hops, and Zion to this year's event and couldn't be more excited. Our beer presenters won't be outmatched and are offering several options for the beer lover. Half Acre has come back to play and new to the group are Destihl and Triptych. This year is going to top last year's event with the exciting auction." 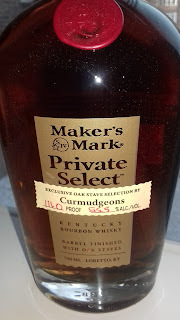 About that auction, one of the items on offer will be this very bottle of Maker's Mark Private Select, Curmudgeons Edition. This is from the barrel created by me and fellow writers Lew Bryson, Fred Minnick and Michael Dietsch last summer. We won't be pouring it in the Lounge, but you can bid on it in the Silent Auction. While it is not quite one-of-a-kind, you won't find it in any stores. You'll be the pride of Peoria if you place the winning bid. Peoria, Illinois, and the nearby town of Pekin, were once whiskey producers on a scale that rivaled Kentucky. The infamous 19th century Whiskey Trust was based there. The town still produces a lot of ethanol. If you're in central Illinois, come say hello and benefit a worthy cause. There is something new to do when you visit Kentucky, drink vintage spirits. Kentucky's Vintage Spirits Law is just a few days old, but I've been working on my personal wish list. These are all whiskeys I have had at some point and would like to have again. Where I have indicated a label, that wording identifies the distillery where the whiskey I tasted was made, to distinguish it from other versions of that brand made at other distilleries. "What is vintage?" is still a wide-open question, until the Kentucky Alcoholic Beverage Control Department issues some regulations. All they have released so far is the following, elaborating on the new law's notice provision. "Effective January 1, 2018, a retail licensee selling vintage distilled spirits purchased from a non-licensed person must give the Department prior written notice of the proposed retail drink or package sale, which includes the following information: (1) name and address of seller; (2) the quantity and name of the alcohol product being sold; (3) the date of the sale; and (4) name and license number of retail licensee." I will here express again my hope that Kentucky will be truly conservative and regulate this trade as little as possible. So far so good. Let's hope they continue to let the market work its magic so millions of bottles now gathering dust in attics and basements can soon be liberated, freed to fulfill their noble destiny, all nice and legal like. Before anyone contacts me with offers to sell any of the whiskeys on my list, don't bother. Transactions between non-licensed people are still illegal everywhere. If, however, you are a licensed Kentucky retailer engaged in vintage spirits reselling, and you have any of the above to sell, let me know. Although the word 'vintage' suggests age, there is nothing in the new law that requires the bottle to be old. Mainly, the product cannot now be available in Kentucky through normal channels. My main interest is American straight whiskey, but Kentucky's new law encompasses all distilled spirits, so scotch, cognac, rum, Chartreuse; it's all in the game. So much remains to be seen. This isn't just bars, remember, selling by the drink. Package stores may buy and resell whole bottles. Not every retailer will participate. Many will wait until the rules are clearer, but some will jump right in. Most of the risk is on them. 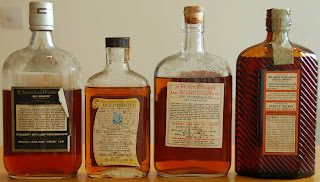 If you have some vintage spirits you might want to sell, is now the best time to liquidate your collection? Maybe, but probably not. If the whole thing goes bust (a possibility), now might be your only chance. Otherwise, it probably makes sense to at least put a toe in the water, if only to find out who is buying and how much they might be willing to pay. Pick a few bottles you can part with easily. Keep your gems in reserve. If you do, please remember that the buyers are businesspeople. They expect to make a profit, so they will price the bottle they bought from you at price higher than what they paid you, possibly a lot higher. That's how it works. I regret that it is necessary to explain this but from experience I know it is. I can't emphasize enough what a big deal this is, potentially. It could be huge. It might even be the first wave in the ultimate legalization of the entire secondary market. On New Years Day, we answered once and for all the question "Is Jack Daniel's Bourbon?" There is more to the story, however, going back almost 200 years. In the 19th century, it was common among Tennessee distillers to run their new make through sugar maple charcoal. For roughly the first half of that century, most whiskey was sold unaged, but improving the flavor of new make continued to seem like a good idea even after aging became the rule. By the 1950s, Jack Daniel's was the only distillery in the United States still leaching. They wanted to talk about it in marketing because they thought it made their whiskey unique, but 'leaching' didn't sound very appetizing. The process needed a new name. 'Lincoln County Process' was derived from the term 'Lincoln County Whiskey.' From the early 1830s, Tennessee's Lincoln County was renowned as America’s most productive corn cultivation district. Lincoln County was once much larger than it is now and included the Jack Daniel's Distillery in Lynchburg. Moore County, where Jack Daniel's is today, was established in 1871 from parts of Lincoln and three other counties. Lincoln County's reputation for fine corn passed on to its whiskeys. Like Monongahela rye, the use of Lincoln County corn was a selling point for middle Tennessee whiskeys. Starting in 1866, distilleries and brokers advertised in newspapers their ‘Lincoln County whiskey,’ specifically to differentiate it from the Robertson County product, Tennessee’s other popular whiskey style, as well as from Kentucky bourbon and other regional whiskeys. During the early 1900s, the Jack Daniel's label stated ‘Jack Daniel's Pure Lincoln County Corn Whiskey.’ It was never called bourbon. That would have been unthinkable. That is how the Lincoln County Process got its name, but what about the process itself? Does it disqualify Jack Daniel's from being called bourbon? People who say it does cite section 5.23 (b), which reads in part: "Extractions. The removal from any distilled spirits of any constituents to such an extent that the product does not possess the taste, aroma, and characteristics generally attributed to that class or type of distilled spirits alters the class and type thereof, and the product shall be appropriately redesignated. In addition, in the case of straight whisky the removal of more than 15 percent of the fixed acids, or volatile acids, or esters, or soluble solids, or higher alcohols, or more than 25 percent of the soluble color, shall be deemed to alter the class or type thereof." The only problem is, 5.23 (b) doesn't apply since charcoal leaching occurs before the distillate has been classified. Until it touches an 'oak container,' it is not whiskey, let alone bourbon. You can't change the classification of something unclassified. Section 5.23 very clearly applies only to classified products. If a post-classification process changes the liquid's characteristics, as described in the rule, then reclassification is necessary. Since whiskey must be aged, section 5.23 clearly applies to aged liquid only, not to new make. Most distillers agree that pre-barrel charcoal leaching functions as a kind of jump-start to the aging process, removing or modifying some of the undesirable congeners that will eventually be removed or modified by the oak barrel's charred interior surface. Jack Daniel's may age a little faster as a result, but that's it. The bourbon gods are not offended. This got confused when the type of charcoal leaching practiced in Tennessee became less common, because charcoal leaching is also widely employed by rectifiers. In 1868, the Federal Government passed a number of taxation acts, based on the 1864 Special Tax Act and the amended Trades Special Tax of 1866. One of these included a tax on rectifiers. Rectifiers were defined as: "every person who rectifies, purifies, or refines distilled spirits or wines, by any of process other than the original and continuous from mash, wort or wash, through continuous closed vessels and pipes, until the manufacture thereof is complete, and every wholesaler or retail liquor dealer who has in his possession any still or leach tub; or such keep and apparatus for the purposes of refining any manner distilled spirits (etc.)" 'Leach tub' refers to the process of rectifying a spirit by filtering it through charcoal. The Rectifiers Special Tax was based on the volume of spirit a rectifier processed. The average tax was $4 a barrel. A spirit barrel was defined as 40 gallons at proof strength (i.e., 50% alcohol by volume). 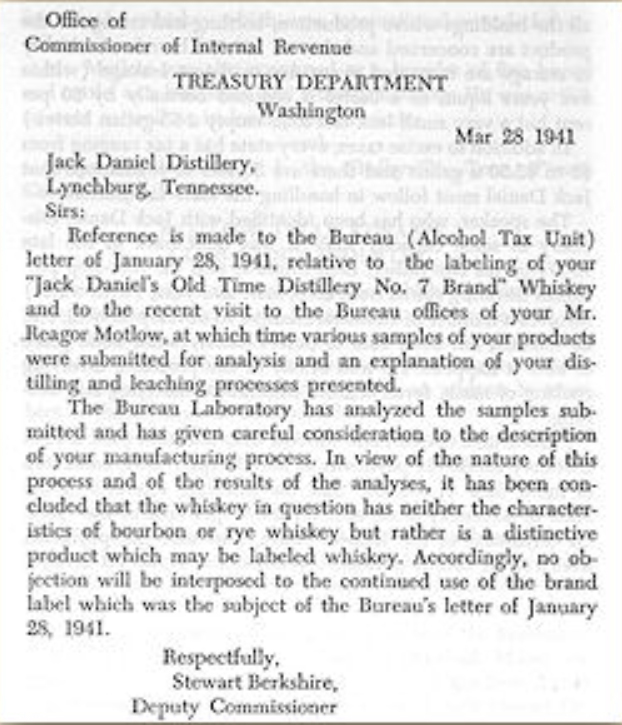 The Tennessee distillers lobbied the IRS and gained an exception to the tax for their ‘redistillation, leaching and vaporising’ methods, which they used to make straight whiskey, not neutral or nearly-neutral spirit as was the business of rectifiers. 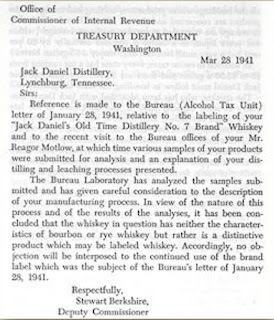 The Tennessee distillers insisted they were not rectifiers but primary distillers and, as such, they were already paying the Federal Excise Tax on their output. Levying an additional rectification tax on the same liquid would be unfair. In agreeing and granting the exception, the IRS effectively recognized Tennessee whiskey as a distinctive version of straight whiskey, way back in the 19th century. The new liquor laws passed right after Prohibition did not include a contingency for Tennessee’s charcoal leaching method. This may be because no one in Tennessee was distilling at the time due to Tennessee's state Prohibition laws remaining in effect after 1933. When distillation finally became legal again in 1937, only Jack Daniel's came back in a meaningful way. They resumed making 'Lincoln County Whiskey' the way they always had, using Lincoln County corn and charcoal leaching of new make before barreling. Because so few distilleries came back after Prohibition, a once common practice was nearly extinct. Only one distillery, Jack Daniel's, was still doing it. When the time came to start selling their whiskey, Jack Daniel's sought an exception similar to the one granted in 1868. They wanted to be acknowledged as distillers of a straight whiskey product, but one that was distinct from bourbon or rye. They wanted the feds to create a Tennessee whiskey classification but settled for 'whiskey.' Then they put 'Tennessee' in front of it as a truthful statement of product origin, which was permitted under the new rules. That is how the designation 'Tennessee Whiskey' was born. The fact that Jack Daniel's was accepting a lower classification and rejecting a higher one also suggested a one-off proposition, an anachronism unlikely to recur. Writing a letter is much more efficient, administratively, than undertaking the rule change process. The fact that this occurred almost 80 years ago and hasn't caused any problems (other than confusing a few obsessives) means it was probably a good administrative decision. Chris Middleton, the former Global Brand Director for Jack Daniel’s, helped a lot with this post. As of the January 1 start date, ‘the department’ (i.e., the Kentucky Alcoholic Beverage Control Department [KABC]) had issued no administrative regulations or guidelines. As of now, what you see above is all the guidance there is. Retail license holders who want to take advantage of it will have to interpret the new law for themselves, with advice of counsel, of course. There almost surely are rules coming. The KABC has held some meetings and is accepting suggestions. If you want to contribute, address your thoughts to Christine Trout, Commissioner, Department of Alcoholic Beverage Control, 1003 Twilight Trail, Frankfort, KY 40601. You can also include your suggestions in the comments below, if you wish, but I’m pretty sure nobody at the KABC reads this blog. The Presidents' Forum (TPF) is a trade association for distilled spirits producers that focuses on regulatory issues. It has submitted its thoughts in a letter to the KABC. TPF worries “that any product sold outside of the three-tier system carries a risk of being counterfeit/contaminated.” They are also concerned about harmony between the new state law and relevant federal regulations. Under TPF’s suggested rules, all transactions would have to be in person. Checks only, no cash. Sellers would have to provide ‘a sworn affidavit’ to the retailer-reseller, including their name, address, phone number, and email, as well as a statement of when, where, how and from whom the vintage spirits were acquired. The retailer-reseller would be required to keep a record of the seller's vehicle: make, model and license plate number; as well as legible photographs of the bottles being acquired showing front and back labels, intact capsule closures, etc. Retailer-resellers would, of course, then provide all this to the KABC along with the date and time of the transaction, a description of the vintage spirit acquired, its quantity and the price paid. Retailer-resellers would have to label all bottles obtained in this way so the consumer knows they came from the secondary market. TPF suggests ‘vintage’ should be defined as pre-metric bottlings only, which means nothing after 1981. This has the advantage of being very easy to determine, but would exclude those ‘early 90s bottlings’ Rice wants. Long term that is a crazy standard, since it will keep receding further and further into the past. 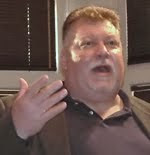 Since the assumption is that the vintage spirits on offer will have been originally obtained legally at retail, and the vintage spirit transaction is between a non-licensed post-retail owner and a licensed retailer-reseller, who will then transact a retail sale with a consumer, it is hard to see where the producers even have a dog in this fight. But anybody can make suggestions, so they did. TPF, in conjunction with the Wine and Spirits Wholesalers of America, also asked the feds to opine on whether or not retailers taking advantage of the new state law would be breaking any federal rules. Again, this doesn't affect producers or wholesalers directly, they're just looking out for the little guys. The feds expressed concern that people might use the Kentucky law to become unlicensed vintage spirits wholesalers. Federal law says it is illegal for a retail license holder to acquire alcohol from a non-licensed person who is “engaged in the business of purchasing beverage alcohol for resale to wholesalers or retailers.” If the seller is not as described, then the law doesn't apply. That standard is just vague enough to cause problems. Kentucky’s current governor, Matt Bevin, is a proud conservative Republican, which should mean he favors minimal regulation. Does that apply to alcohol in a state where 20 counties still permit no alcohol sales and many others severely limit it? I hope it does. Kentucky's new law is revolutionary in terms of bringing at least the ‘vintage’ part of the whiskey secondary market out of shadows. It could be a significant boon to tourism. Why not wait to see what problems arise, if any, rather than write rules in a vacuum? That puts a lot of responsibility on retailers who choose to become vintage spirits buyers and resellers. No one wants to risk their license, so diving into this pool is not for the faint of heart. Meanwhile, it should be interesting for the rest of us to watch and perchance to taste.